Have you ever heard of John Wayne Casserole? Delicious layers of ground beef, cheese mixture, fresh vegetables and Jalapeno peppers baked on top of a biscuit crust make for an amazing weeknight dinner! 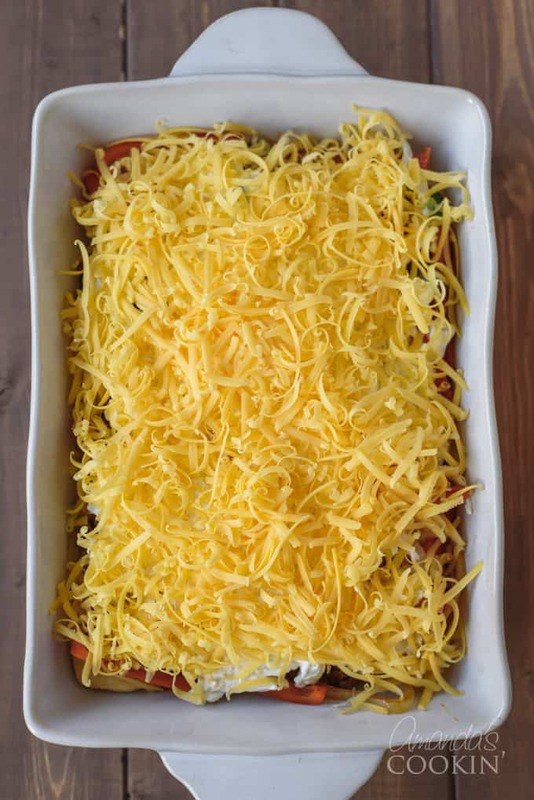 There’s an interesting story about this casserole below, but what you really need to know is that it’s a delicious option for a dinner leftovers too! 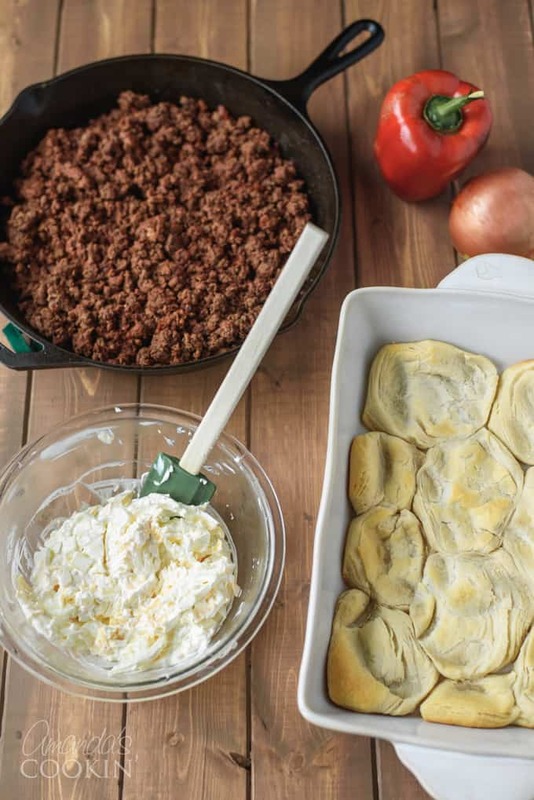 Like my taco empanadas, this recipe is one of my top picks for dinner ideas that use ground beef. Casseroles are really popular, but it’s taken me up until the last ten years to really embrace them. This is one of my favorites, along with my Hamburger Casserole! Why is it called John Wayne Casserole? Apparently, this John Wayne Casserole recipe has some interesting origins, including information on why it’s named what it is. Regardless of its origins, it’s a tasty dinner that your family will love. The jalapenos do not make this too hot, so don’t be too concerned about that. Give it a try and let me know what you think! I used Pillsbury Grands biscuits. I’m sure a generic or store brand would be fine as well. I don’t think I would bother making biscuits from scratch for this since they are just going to get buried, but if you prefer to do that, here’s a recipe for homemade biscuits you can use. Place biscuits in greased 13×9 pan in a single layer and press into the pan, joining them together, pressing the dough halfway up the sides of the pan. Place pan on a baking sheet and bake dough in preheated oven for 15-25 minutes at 350 F; checking every few minutes after 15. The dough should be very light brown where the edges are just starting to get color. Remove from oven and set aside, leave oven on. In a separate bowl, combine sour cream, mayonnaise, half of the cheddar cheese, and half of onions. Stir well and set aside. Combine the browned ground beef with the taco seasoning and water, and cook according to packet instructions. Transfer cooked taco meat to a bowl and set aside. Wipe out pan. Saute remaining onions and bell peppers on the taco meat pan until slightly tender. 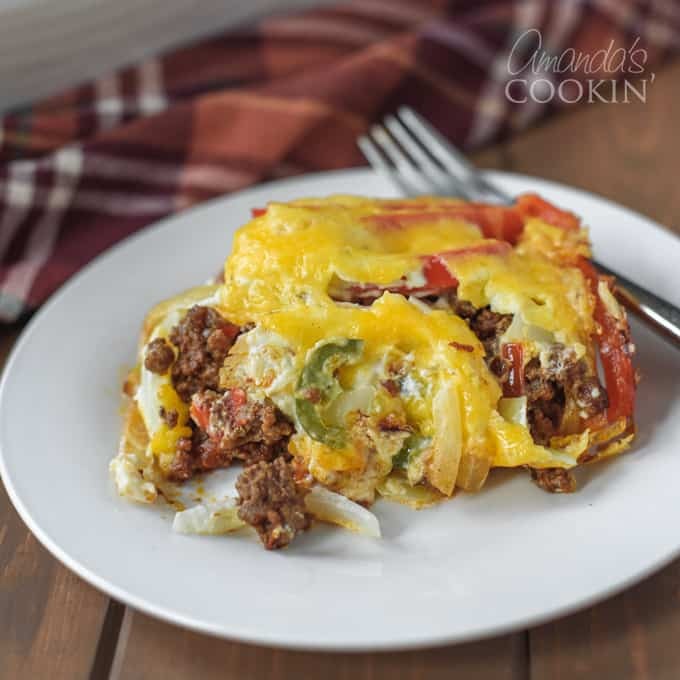 On top of baked biscuit crust, layer ingredients in the following order: taco meat, tomato slices, bell pepper and onion mixture, Jalapeno peppers, sour cream mixture and sprinkle with remaining shredded cheese. Bake uncovered for 30-40 minutes or until edges of dough are lightly browned and cheese is melted. Hope you enjoy it, I know we did! A lot of people have commented below saying they love this John Wayne Casserole and it’s become a regular part of their recipe rotation. 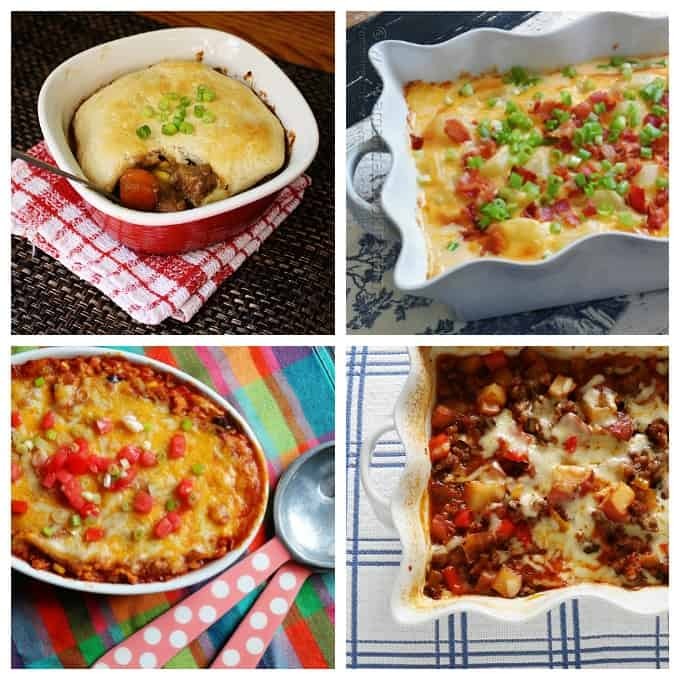 I have some more casseroles you’ll like as well. Try some of these and let me know! A very popular ground beef or lamb recipe is Shepherd’s Pie. It’s one of those comforting recipes, and one that’s been around for a long time. There are so many different versions of Shepherds and Cottage Pie. This is my take on the classic, and it’s one the whole family loves! I grew up eating beef stew. Turning it into a simple casserole, especially fun little single servings was easy to do. My Beef Stew Biscuit Pot Pie pictured below has become a family favorite. 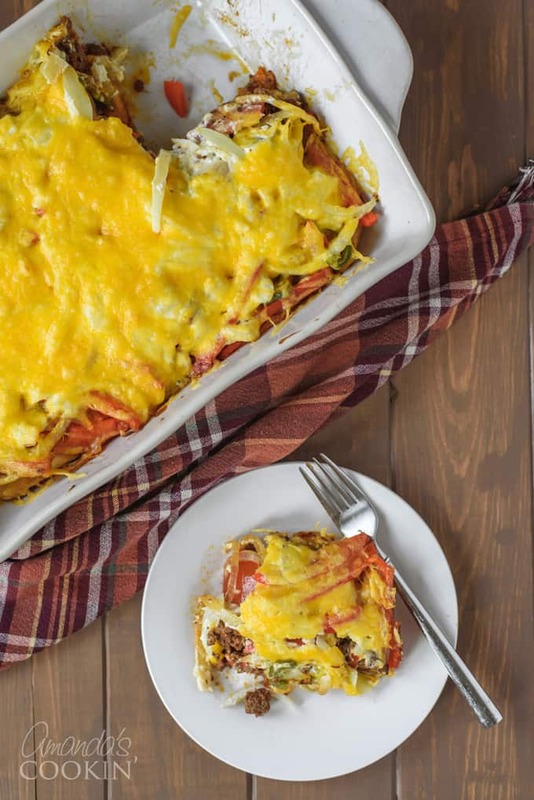 It’s a great way to combine comfort food and the ease of a casserole in one. It’s also perfect for leftover stew! One of my favorite casseroles of all time doesn’t actually have any meat in it. On top of it, yes, but not in it! I’m a potato lover through and through, and I live in Wisconsin, so cheese is pretty much inevitable. The first time I made these Bacon Topped Three Cheese Potatoes I knew they would be a hit. This Chicken Tostada Casserole is truly delicious. If you’re looking for something to use leftover chicken or a rotisserie chicken in, try this enchilada flavored dish. I use homemade enchilada sauce, the recipe for that is available in the tostada casserole post as well. But if you prefer, you can use canned. I remember when I made this Sweet Italian Sausage, Pepper and Potato Bake for the first time. It was a recipe I developed on my own and it ended up with a bit too much liquid. But that did not stop us from eating the entire dish! In fact, it’s kind of like a stew and casserole in one! Have you ever heard of John Wayne Casserole? There's an interesting story, but what's important is that this beef and biscuit casserole is delicious! Preheat oven to 350 F and spray a 13x9 glass baking dish. Place biscuits in pan in a single layer and press into the pen, joining them together, pressing the dough halfway up the sides of the pan. Place pan on a baking sheet and bake dough in preheated oven for 15-25 minutes; checking every few minutes after 15. The dough should be very light brown where the edges are just starting to get color. Remove from oven and set aside, leave oven on. While biscuits are baking, combine the browned ground beef with the taco seasoning and water, and cook according to packet instructions. Transfer cooked taco meat to a bowl and set aside. Wipe out pan. 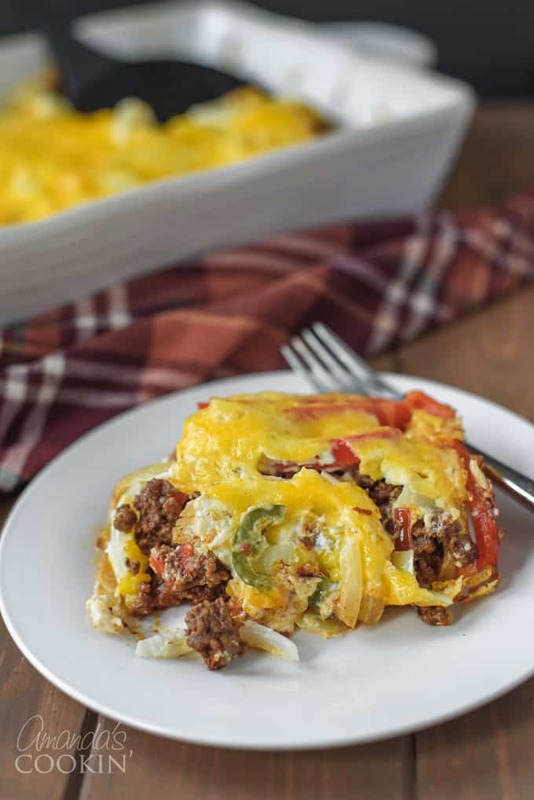 On top of baked biscuit crust, layer ingredients in the following order: taco meat, tomato slices, bell pepper and onion mixture, Jalapeno peppers, sour cream mixture and sprinkle with remaining shredded cheese. Bake uncovered for 30-40 minutes or until edges of dough are lightly browned and cheese is melted. This post was originally published here on Apr 22, 2015. Thanks Brenda, so glad it was a success! Oh my goodness, Amanda! This was very delicious! I made it on a Monday night for supper. My husband, a very picky eater, was hesitant to try this, but ended up eating ate half the pan! Then, on Wednesday morning, the same week, he requested it for supper. Then, Saturday morning, hd requested it for supper AGAIN! We had this almost every night in one week! I added spinach to the onions and peppers. I also, used pastry crust instead of biscuts. Could you adapt this recipe to use tater tots instead of biscuits like the slow cooker version. Would you put them in the bottom or on top? Frozen or thawed? Good questions! I haven’t tried that yet, but I would imagine that placing the frozen tots on the bottom as an alternate crust would work. Let us know if you try it! I always look forward to your monthly Amanda’s Cookin…………….copied some of the recipes which I will try. your printed recipe leaves out all of the instructions for what to do withy the sour cream mayo and cheese and onion. Really is a bummer that the instructions leave out such an important part. Not everyone can run and look on the computer. This is absolutely amazing!! My husband was unsure about it until I told him it was called “John Wayne Casserole”! He had 2 plates of it and now asks for it weekly! 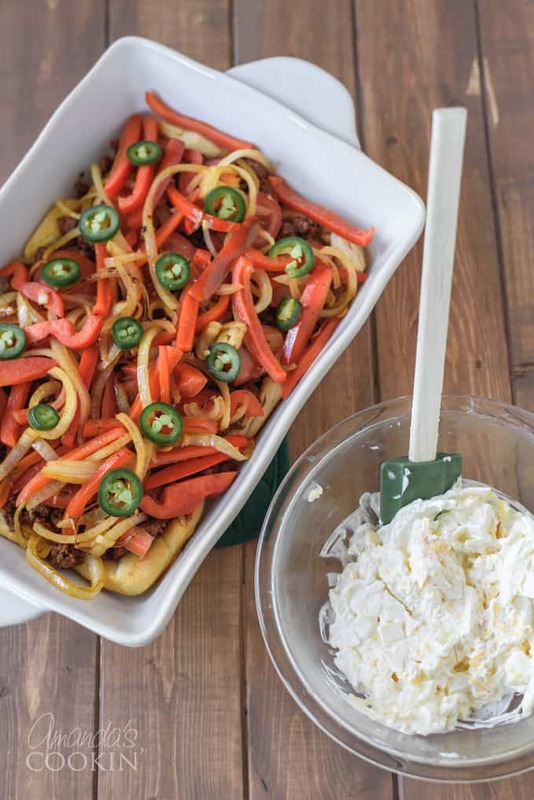 I substituted banana peppers for jalapenos and it was delish! Fantastic! So glad you both enjoyed it! It’s good that you let folks know you put banana peppers in it before hand. I am allergic to banana peppers & I break out in whelps the size of cantaloupes all over my body, have to go to the E/R, get on drip & be pumped full of steroids. It takes 2 weeks for it to work itself out of my system & it’s very painful. I made this last night and it was AMAZING! actually used a leftover meat/refried bean mix from burritos the night before. I think you could safely use half beef, half beans/refried beans because it was still delish! I also chose to use tater tots on the bottom because i forgot to pick up biscuits. Definitely a solid choice. Thank you for the awesome recipe! It’s officially a house favorite. Great idea using the leftovers! This sounds really good but it’s way to much food for a single man with no kids. It’s always hard cooking for 1 person. I’d love to try this if you have any ideas on how I can cut down on how much it makes. Amanda, if you cut this recipe in half, does it change the baking time? I don’t think it would. Perhaps five minutes, but definitely not by much. you have leftovers for the next night. I made it last night with the changes mentioned and it was delicious! I used ground turkey, non fat Greek yogurt in place of the mayo and low fat sour cream. The casserole has so many good flavors. Oh love the changes, so glad you enjoyed it!